Copyright �2015 PopEntertainment.com. All rights reserved. Posted: July 24, 2015. 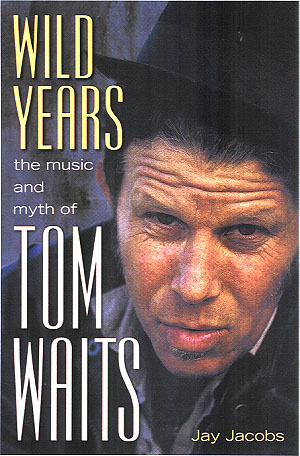 In the crazy, glitzy world of show business, it doesn't take much for a little fame to go to someone's head. That's why its always nice to meet a TV or movie star who is completely grounded, just a normal, nice person doing what they love. Smulders spent most of the past decade as a key component in one of the most popular, long-running comedies on TV. As Robin Scherbatsky, the Canadian teen-pop-star turned New York cable news anchor, Smulders spent eight seasons pounding down beers and talking about life and love at local watering hole McLaren's pub with co-stars Josh Radnor, Jason Segel, Alyson Hannigan and Neil Patrick Harris. Her character survived career turbulence, love affairs with two of her best friends and eventually a wedding that lasted the entire final season of the show. Even during the run of the series, Smulders started branching out into films, taking on starring roles in such varied projects as the comedy Delivery Man with Vince Vaughn, the Nicholas Sparks romantic drama Safe Haven with Josh Duhamel and Julianne Hough. She even played the voice of Wonder Woman in The Lego Movie. However, perhaps her biggest film breakthrough was smashing into the Marvel comics universe, playing Agent Maria Hill in the films Avengers, Captain America: The Winter Soldier, Avengers: Age of Ultron, and even the TV series Agents of S.H.I.E.L.D. This summer alone, Smulders has three films released: the aforementioned Avengers blockbuster Age of Ultron, the offbeat romantic comedy Results and the sweet indie comedy/drama Unexpected. It's a pretty heady workload for an actress who is in her early 30s. Particularly considering that while filming Results and Unexpected, Smulders was pregnant with her second child with actor/comedian husband Taran Killam. However, like I said before, Cobie Smulders isn't the kind of person to let things go to her head. She recognizes that she is in something of a dream position and she takes none of it for granted. An example, if you may. I recently met with Smulders at the Crosby Street Hotel in SoHo, New York, to discuss her latest film Unexpected. The second I walked into the room, she smiled brightly and said, "Hey, I know you." I'm not telling this story because Smulders actually remembered me, though of course that is gratifying. Honestly it is rather shocking she recalled, considering how many interviews she has undoubtedly done in the time since we last spoke. However Smulders went so far to prove further that it was a strong memory. When we started the current interview she smiled, "I wish we were at McGee's having a pint. Another time." As mentioned above, McGee's was the location of our last interview. It's a small thing, but it says so much about Smulders as a person. She takes the time to appreciate the ride that is going on around her, to share in her success and to never, ever take anything for granted. This approachability and genuine sense of decency extend to her screen persona: an attractive, smart and good-hearted openness which makes her perfect for the role of both the ideal love interest or best friend. Now, we are a little over a year on since the finale of How I Met Your Mother. "I miss all these people so much," she said wistfully, looking at an old photo of herself with her co-stars. However, her life and career are taking her on different paths now. With a busy summer of three new movies hitting theaters (and the recent announcement of her signing on for another new film, the first movie to be directed by actress Clea DuVall), Smulders has been rushing from one project to the next. So, how has her life changed since How I Met Your Mother ended? "I have a lot more air miles," Smulders said, smiling. "It's been a lot, but it's been lovely inconsistency. I was so blessed to be on that show for so long, and work with the same people for as long as I have. I really miss everybody every day. And the job and the character every day." However, as much as she enjoyed the comfort of a stable and enjoyable job, she is also getting into the idea of being more in control of her own destiny. "It's terrifying and also very freeing and lovely to be able to choose your own things. Sometimes say 'No.' Sometimes say 'please??? Please hire me!'" Smulders laughed, "It's been lovely. We moved to New York. So there's been a lot of changes. It's been really exciting. I've been very lucky." One of those changes is one that also forms one of the main plot threads of her latest film, Unexpected, which will be opening in New York and On-Demand on July 24th. 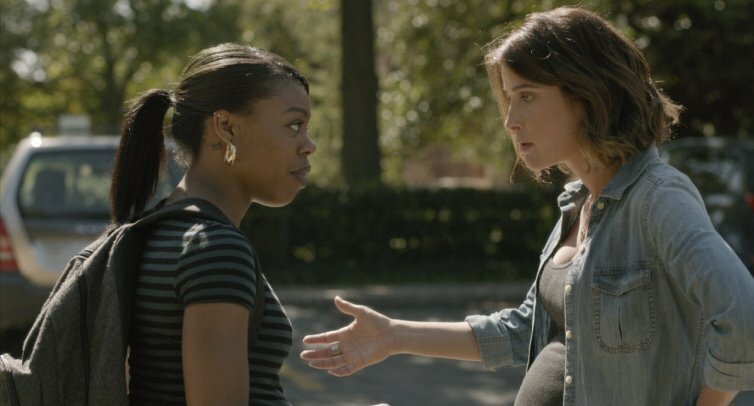 In that film, Smulders plays Samantha, a teacher in a Chicago inner-city school whose life is thrown into a certain amount of turmoil when she learns that she has become pregnant. As a dedicated career woman who was not planning to have children yet, Samantha is concerned about her ability to juggle her career and motherhood. Smulders has had to deal with many of the same concerns, though she recognizes she is in a different situation. "It's a balancing act," Smulders said. "A balancing act, always. It's really about trying to be as present as possible when you are with your kids. Be with your kids, and when you're at work, try to be at work. It's hard to turn off the other thing when you are with one of them. It's challenging, but I'm very grateful. As a working mom I'm in a very good spot. There are so many women out there that are working a lot harder than me, with a lot more to do. I just feel very grateful." Unexpected is loosely based upon the life of writer/director Kris Swanberg, who was an inner-city Chicago school teacher who got laid off due to her school being closed for lack of funding. As that was happening, she was pregnant and learned that one of her former students was also having a baby, so they grew closer over the shared experience. Swanberg is also currently pregnant again, due to have a baby soon after the film opens. Though the film was based upon Swanberg's life, Smulders also felt that the story had a strong familiarity to her own life. "Very much so," Smulders said. "I was pregnant, so obviously all this pregnancy stuff we were talking about was really relatable to me. As well, having a young child and going through pregnancy and delivery. All of it fed in to my little brain. I was able to click back in to those moments, when need be." Smulders was particularly intrigued by the fact that the movie did not fall into the normal clich�s. It portrayed an important part in any woman's life, but it did it in a quirky and intriguing way. "I read it and it was a version of the pregnant movie that I hadn't seen," Smulders said. "I feel like this was told more from the female perspective." Even more intriguing was the central friendship, between her character of Samantha and that of her student Jasmine (played by terrific newcomer Gail Bean). They come from two very different worlds, and yet they deepened a connection through a shared experience. 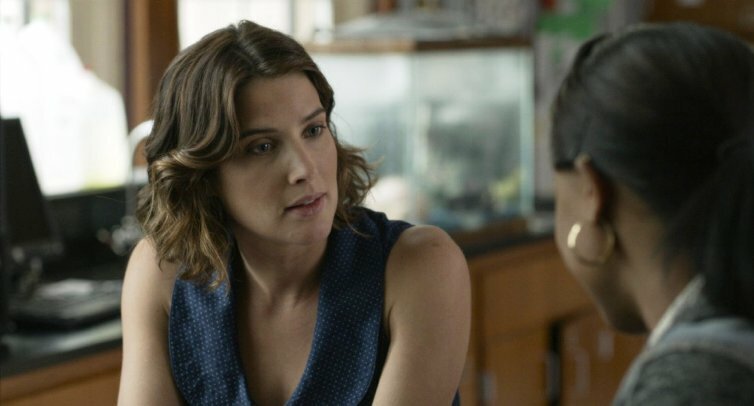 "To me, one of the more interesting things about it � I mean there's a lot in it that's relatable to me as a woman who has children � but it was such an interesting way to showcase this relationship between these two women," Smulders continued. "It was a relationship I hadn't seen on screen. Under any other circumstance, I don't think that you would see it. I think that these women were bonded together because of their pregnancies." Smulders also liked the fact that the characters did not necessarily connect with their expected roles. Just because one of the women appeared to be older and wiser did not mean that she had all the answers. "It was an interesting way to link these women together and watch their journeys unfold," Smulders chuckled. "The thing that resonated with me, too, which I found really interesting was that these are two women, one of which is in a stable relationship. A great place. She went to college. She has her career in check. She is in a good place. The other one is young, wanting to go to college. Has a boyfriend that is not really around. And the younger of the two is having an easier time with this pregnancy. I thought that was really interesting, seeing these two different women and how they interacted." Of course, the most vital part of making the film work was finding the right actress to play against Smulders as her young charge, a poor-but-smart city girl who was trying to balance her impending future as a single mother with her dream of going to college. The film lucked out with Gail Bean, a young actress who has been working in movies for about five years. She has had small roles in several indies and shorts, even one large role in the little-known film At Mamu's Feet. However, Unexpected is her biggest role and biggest production so far, and she easily kept up with her more seasoned co-star. "She was lovely," Smulders recalled. "I think she was very difficult to cast. That part was really hard to find. When Kris found Gail it was just perfect. The thing about Gail is she's supremely talented, but she's also just... what, 22, 23 or something now?... and she seems so much older than that. She's very wise, but on the other hand she has a lot of vulnerability to her. She's very open. She's very connected. She was just really amazing to work opposite." Part of the tension in the film revolves around the fact that Samantha cares deeply about Jasmine but sometimes seems to not recognize that they reside in very different circumstances. Samantha looks at Jasmine's problems from the perspective of a middle-class white woman, and she believes that anything is possible for the girl. Jasmine, who grew up with little money, tends to be a bit more pragmatic about life's limitations. For example, Samantha becomes determined that if she pulled some strings, Jasmine would be able to continue following her college dreams away at Samantha's alma mater, the University of Illinois. Samantha is trying to do it out of love and belief in Jasmine, but Jasmine is more concerned about things like scholarships, housing and child care. "I think that her emotions get a little bit mixed and she gets a little bit too involved," Smulders acknowledged. "Also, what she thinks is best for Jasmine is not necessarily what Jasmine thinks is best for Jasmine. That's really how it resonates. Another thing I love about the film is seeing this last scene with Jasmine at the barbecue surrounded by this amazing family that love and support her so much. That family is really important to Jasmine. That is such a beautiful thing in itself. We end the film and Jasmine is not giving up on going to school and having a career. She's still pursuing that, but just in another way." Samantha's family is there for her as well, but in a slightly different way. 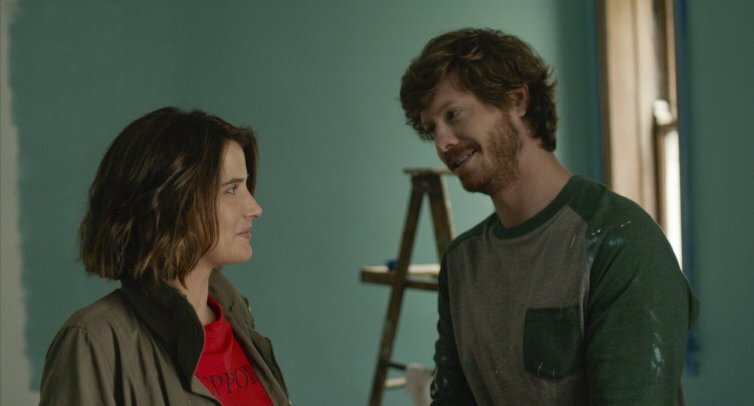 Samantha is unmarried when she gets pregnant, but she is involved in a very committed relationship with John, played by Anders Holm of Workaholics. He immediately steps up and they get married, but Samantha worries that perhaps he did it because of the pregnancy rather than the relationship. Holm and Smulders, both of whom have long histories in TV comedy, had a strong, natural connection as a film couple. "The great thing about him and what he brought to this part was that it could be this kind of a jerk husband, who is like: 'You can't do it. You've got to stay home. You've got to do this,'" Smulders explained. "He did that in a way that it just made it seem like: yeah honey, I support you and I love you. I want you to be happy, but this is the reality. He was never mean about it. It was just he was the voice of reason. I think that can come off sometimes as a little bit mean, but because he is who he is and he did a great job of it, he was able to be that voice without coming off as being too negative." Her mother is played by Elizabeth McGovern, who had her own experience in a pregnancy film: the 1987 John Hughes drama She's Having a Baby, co-starring Kevin Bacon. However, Smulders did not get any of the dirt about making that somewhat similar film. "She didn't [talk about the experience]," Smulders admitted. "Elizabeth came to us helter skelter. She wrapped on Downton Abbey and flew very soon after and came to us. She started working the next morning. We didn't have a lot of time to rehearse and run things, but she came in just perfectly ready to fulfill this role. She was just so easily affected by everything. "Again, it's another role, both her and Anders, they could have been just whiny nay-saying characters, but Elizabeth really brought a lot of humanity and depth to this woman, who really just wanted what was right for her daughter. Really wanted her daughter's life to be perfect. It was such a beautiful change to go from this woman that saw that vision of her daughter going down the aisle in white shatter, and to pick up the pieces and be the mom that her daughter needed her to be." Also of great importance to Smulders' character was her work as a teacher in one of Chicago's poorest neighborhoods. A good amount of the film's time looks at the children and the problems with inner city schools being starved of funds and closed down in the communities that need them the most. Smulders feels for the parents and students. "I would love to figure that out," Smulders said. "I would love for education to be free. I'd love for it to be equalized. I'd love for friggin' university to be free. You look at Europe, even in Canada, where I'm from... it's laughable how much college is. It's like $5,000.00 for the whole year for tuition. I don't understand why it has to be so expensive [in the US], but it is. It would be nice to see better schools. Also getting teachers more equalized and better paid. It would be nice. That would be really nice." She paused and laughed slightly. "I don't know how to fix that system. Luckily that's not my job, because that seems like a massive undertaking. But it would be amazing to see it happen in the near future." One thing we will be seeing in the near future, though, is more of Smulders in our multiplexes. With Unexpected just about to premiere, this is her third film to make theaters this summer. Another indie film which came out last month was Results, a mixture of workplace drama and romantic comedy about an Austin, Texas gym. The subtle and slightly subversive film, directed by cult director Andrew Bujalski (Computer Chess, Funny Ha Ha) allowed Smulders to play totally against type, as a cynical and bitter fitness instructor whose fling with her older boss (played by Guy Pearce) eventually becomes more serious than they originally intend. Though her character in Results was a fitness freak and constantly working out and looking buff, Smulders was actually pregnant while filming that movie as well, though not as far along as she was in Unexpected. Hiding her pregnancy on film was an interesting experience for her, though it looks surprisingly seamless on screen. "It was interesting," Smulders said of the experience. "I wasn't able to push myself physically as far as I would have liked. But, it was still early on, so I was able to do a lot. It was slightly challenging. We got through it and everyone was so accommodating and really understanding. It was one of those that just kind of timed out perfectly and we were able to sneak it by and keep going and really, really show off the pregnancy in this one." Also, of course, Smulders continued her ascension into the Marvel comics universe, appearing in the summer's big blockbuster Avengers: Age of Ultron. Smulders continued her turn as S.H.I.E.L.D. agent and Nick Fury confidant Maria Hill. This role alone should keep Smulders employed for years. It's something of a given that Marvel characters float from project to project. So far, she has played the character in Avengers, Captain America: The Winter Soldier, Agents of S.H.I.E.L.D. and now Age of Ultron. So, tell us the truth, Cobie Smulders. Does she have to be constantly on call in case Marvel decides they want to drop her into one of their blockbusters? "[Do] I have the microchip installed and I drop everything when it goes off?" she asked, good naturedly, shaking her head. "No." So what is it like to be part of such a massive series of projects, one with such a huge international following? "It's wonderful," Smulders said. "It's amazing. It's so fun. With Ultron coming out it was just another whirlwind experience. Shooting it was awesome and then having it come out and having fans react to it. Anything that has to do with Marvel comes back to its amazing fans. The support and the love they have for these characters is just a really cool thing to be a part of. To go to the Comic-Cons and to see everybody and to feel that excitement is quite thrilling." 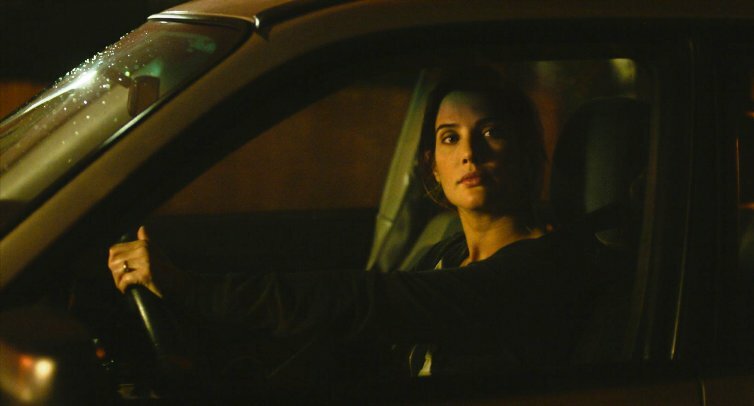 Excitement seems to be a vital word for Smulders in this stage of her career. Coming off almost a decade having a dream job, she wants to spread her wings a bit and see where things take her. Next up is a just-announced untitled ensemble film, which will be the directing debut of actress Clea DuVall (Argo, Jackie & Ryan). Smulders will be working with a cast of diverse talents such as Melanie Lynskey, Jason Ritter, Natasha Lyonne, Vincent Piazza, Ben Schwartz and Alia Shawkat. And then? Who knows? Smulders is enjoying the freedom of picking and choosing her projects. She'll do indies. She'll do big budget. She'll do anything, as long as the script intrigues her. "It's a case by case scenario," Smulders admitted. "I'm interested in just trying out different characters. Working with people that I enjoy and I respect and that seem like they'd be a lot of fun. But it really, really just comes down to script and story. Trying out different things. I'm trying to challenge myself and keep myself interested." CLICK HERE TO SEE WHAT COBIE SMULDERS HAD TO SAY TO US IN 2008! #1 � 2015 Jay S. Jacobs. All rights reserved. #2 � 2015 Jay S. Jacobs. All rights reserved. #3 � 2015. Courtesy of The Film Arcade. All rights reserved. #4 � 2015. Courtesy of The Film Arcade. All rights reserved. #5 � 2015. Courtesy of The Film Arcade. All rights reserved. #6 � 2015. Courtesy of The Film Arcade. All rights reserved. #7 � 2015. Courtesy of The Film Arcade. All rights reserved. #8 � 2015. Courtesy of The Film Arcade. All rights reserved.